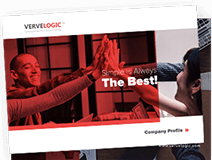 Verve Logic is leading Domain Registration and Domain Transfer services company providing secure and reliable domain registration and domain transfer services in competitive prices helping clients expand their online business. FREE Email Accounts - Get unlimited personalized addresses with free fraud, spam and virus protection. DNS Management - Free lifetime DNS service which allows you to manage your DNS records on our globally distributed and highly redundant DNS infrastructure. Free Mail Forwards - Create free email forwards and automatically redirect your email to existing email accounts. Bulk Tools - Easy-to-use bulk tools to help you Register, Renew, Transfer and make other changes to several Domain Names in a single step. Privacy Protection - Get access to free Privacy Protection with every Domain Name you register. Maintain your privacy and prevent email spam by masking your public WHOIS details. Domain Theft Protection - Protect your Domain from being transferred out accidentally or without your permission with our free Domain Theft Protection. Control Panel - Use our intuitive Control Panel to manage your domain name, configure email accounts, renew your domain name and buy more services.